Call for papers: Nigeria’s new security threats. T he Institute for Peace and Strategic Studies (IPSS), University of Ibadan (Nigeria) has officially joined our network. WAPSN welcomes Professor Isaac Olawale Albert and his colleagues. 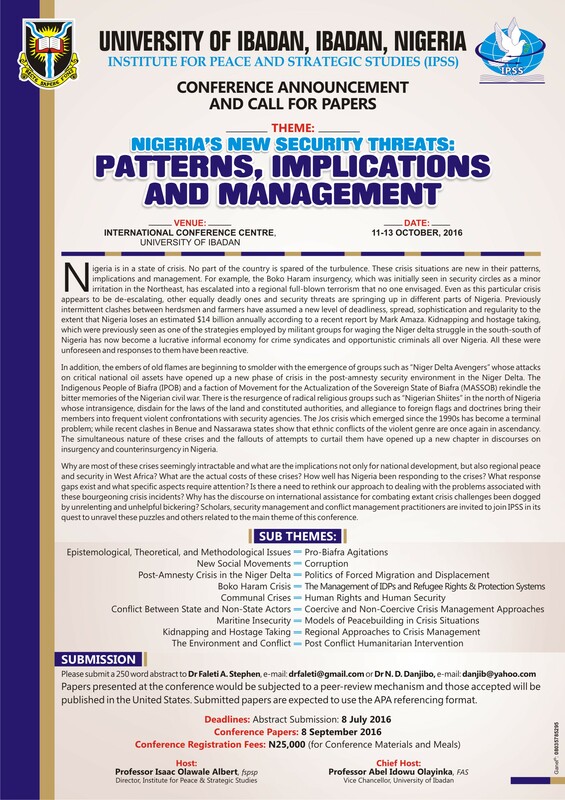 We take this opportunity to announce the conference organised by the Institute on 11-13 October: “Nigeria’s new security threats: patterns, implications and management”. Nigeria is in a state of crisis. No part of the country is spared the turbulence. The crisis situations are new in their patterns, implications and management. Why are these crises seemingly intractable and what are the implications for not only national development, but also regional peace and security in West Africa? Scholars, security management and conflict management practitioners are invited to join IPSS in its quest to unravel these puzzles and others related to the main theme of the conference. For more information on submission and contact details, please click on the document below.